Camillo Evangelista first appears in at Fairport Harbor, Lake County, Ohio, about 1915. Camillo Evangelista, son of Domenico Evangelista and Elisabetta Susi, was born on Thursday, January 2, 1890, at L’Aquila, Italy. Camillo married Giulia Iezzi, daughter of Nicola Iezzi and Maria Serano, on May 25, 1920, at St. Mary Catholic Church, Painesville, Lake County, Ohio. 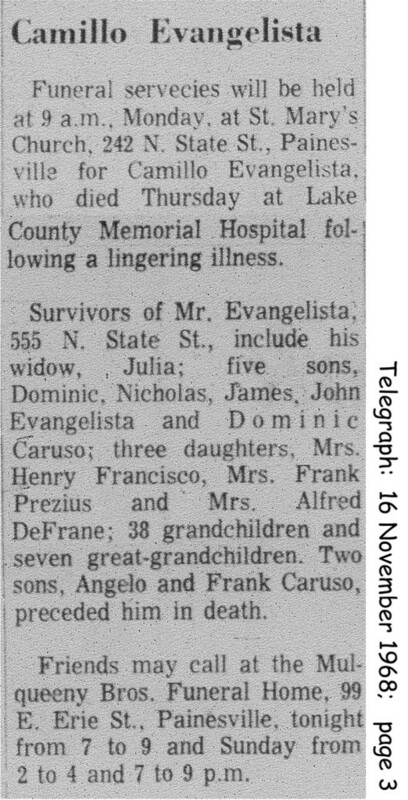 Camillo died on November 14, 1968, at Lake County Memorial Hospital, Painesville, Lake County, Ohio, at age 78. His body was interred at Riverside Cemetery at Painesville, Lake County, Ohio. Camillo Evangelista, age 17, first immigrated to the United States on March 2, 1907. He was travelling to Monaca, Pennsylvania. He was joining his brother, Giovanni Evangelista. Camillo probably returned to Italy in 1908. He served in the Italian Army for 18 months (military service was required at age 18 years). Camillo Evangelista, age 23, is shown to re-enter to the United States on June 10, 1913. He was returning to Monaca, Pennsylvania. The 1913 passenger ship manifest indicates that Camillo was married. Camllo Evangelista registered for the World War I Draft on June 5, 1917. He was living at Fairport Harbor, Lake County, Ohio. Camllo was employed by the Diamond Alkali Company, and was not married. Mr. Evangelista became a citizen of the United States in 1926. Camillo resided at 504 Seventh Street, Fairport Harbor, Lake County, Ohio, when he was naturalized. When Mr. Evangelista married Giulia Iezzi in 1920, she was a widow with three sons. She had a fourth child who had recently passed away. At the time of his death, Camillo resided at 555 North State Street, Painesville, Ohio. Mr. Evangelista was employed by the Diamond Alkali Company of Fairport Harbor until he retired in 1957. Camillo Evangelistla was probably not related to Painesville Italian Virginia Evangelista (wife of Felicantonio Pizzi).